Sources told ABC News that just four administration members have seen the entire plan, which U.S. officials told the outlet has yet to be shared with allies, including Israel. From left: U.S. Ambassador to Israel David Friedman, Special Middle East envoy Jason Greenblatt, White House adviser Jared Kushner, Israeli Prime Minister Benjamin Netanyahu and Israeli Ambassador to the United States Ron Dermer, meeting in Jerusalem on June 22, 2018. Credit: U.S. Embassy in Israel. (April 12, 2019 / JNS) With Israeli Prime Minister Benjamin Netanyahu’s re-election on Tuesday, the Trump administration could release its peace proposal for the Israelis and the Palestinians “as early as this month,” according to ABC News, citing sources knowledgeable of the plan. 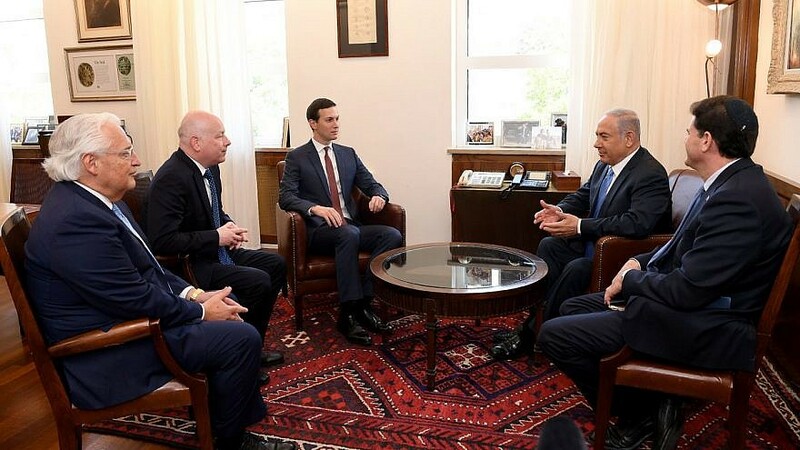 The outlet reported that U.S. President Donald Trump has been briefed on the proposal, which has been in the works for the past couple years by Mideast envoy Jason Greenblatt and White House senior adviser Jared Kushner, also the president’s son-in-law. The sources told ABC that just four administration members have seen the entire plan, which U.S. officials told the outlet has yet to be shared with allies, including Israel. The White House declined to comment to the network about the proposal’s specifics. Last month, U.S. Secretary of State Mike Pompeo suggested that it will break from conventional thinking. Kushner and Greenblatt have been advocating their so-called “deal of the century” through traveling abroad such as to Mideast countries, including the United Arab Emirates, Bahrain, Qatar, Oman and Saudi Arabia. An informed source hearing from top Trump administration officials previously told JNS that the United States is expected to recognize a Palestinian state with its capital in eastern Jerusalem, in addition official U.S. recognition of large Israeli towns in Judea and Samaria.